OVALO — Lee Jennings, 88, died Sunday afternoon, Sept. 15, 2013. Funeral arrangements are pending with Fry-Bartlett Funeral Home of Tuscola. Forrest Lee Jennings, 88, passed away on Sunday, September 15, 2013 at his home in Ovalo. Funeral service will be held at 10:30am Wednesday, September 18, 2013 at the Lawn Church of Christ, Lawn, directed by Fry~Bartlett Funeral Home, Tuscola. Visitation was held Tuesday, September 17, 6 to 8pm at the funeral home. Burial will be at McBee Cemetery. Lee was born to Alvie and Ercel (Powers) Jennings on August 28, 1925 in Hamby. He graduated from Leuders High School in 1943, and enlisted in the Navy in 1944. Lee served in the Pacific Theater in WWII; he was stationed in Hawaii, Marshall Islands, Mariana Islands, and the Philippines. Lee Married Betty Jo Beene on August 9, 1947 in Cisco. 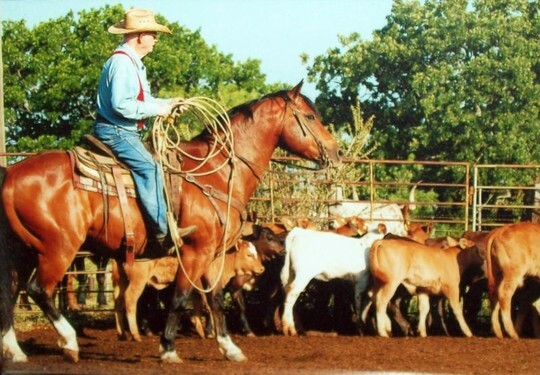 He was employed by Halliburton Oil Well for 20 years, but always desired to be around livestock, especially horses. They moved to their present home north of Lawn 43 years ago. There, Lee became a full time farmer-rancher. He was a lifetime member of the Church of Christ, and attended the Lawn Church of Christ. Before moving to the Lawn area, Lee was an elder at the Baker Heights Church of Christ in Abilene. Lee was a member of the Texas Farm Bureau, Taylor Electric and former member of the Jim Ned School Board. He is survived by his wife Betty, son Russell, daughters, Patsy Shero and her husband Paul, and Nancy Suson and her husband Dwight, and sister Hazel Fillmon. Lee and Betty have five grandchildren, and seven great grand children. Lee's parents, brother, Lawrence, and sister, Jimmie Collum preceded him in death. Lee was a friendly man, and has friends all around this area. We will all miss him. The family requests in lieu of flowers, memorials may be sent to the Lawn Church of Christ, Mission Fund, P.O. Box 176 Lawn, Texas 79530.